The senior class representing the 2017 Class 5A state runners-up Bishop Moore Hornets. Coming to the state tournament with a target on your back is not an enviable position. Yet the 2017 Bolles Bulldogs arrived as such, as the defending state champions. Behind a strong offensive outburst that staked the club to a huge lead in the first inning, Bolles rolled to a 7-2 win over Bishop Moore to win Thursday’s 5A state championship at Hammond Stadium in Fort Myers. It is the team’s second straight title and eighth overall in program history. 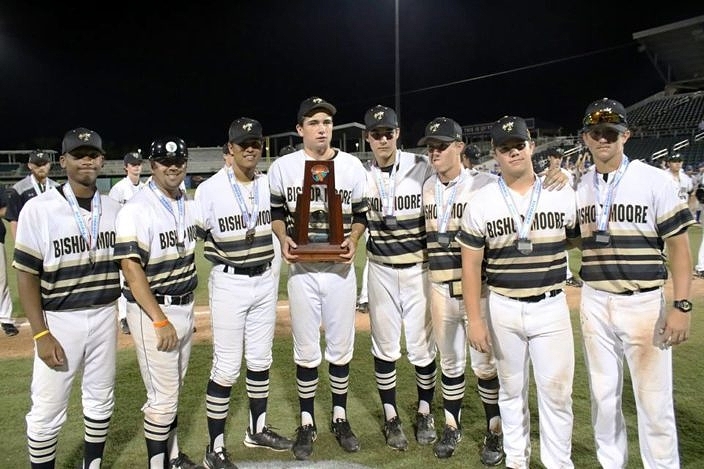 Meanwhile, the sting of defeat did little to diminish the fact that Bishop Moore has worked its way back on the map as a title contender each season. The Hornets played in their second straight state Final Four, after falling in the semifinal a year ago, and the goal is to maintain the program at that high level so that it will continue to come back and battle for state glory every season to come. The Bulldogs attacked with their bats right away to take a commanding lead in the top of the first. Max Ferguson led off with a double to right, Austin Knight was hit by a pitch and Clemente Inclan dropped down a great bunt and reached with a base hit that loaded up the bags. Hunter Barco then put this team on the scoreboard with a fly ball deep to center field that allowed Ferguson to tag up and score for a sac-fly RBI. 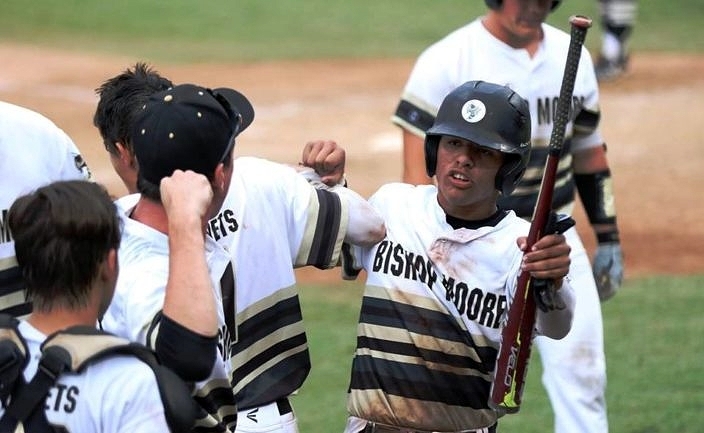 Mac Forrester then sent a liner past the shortstop to plate a pair and Bryson Kirksey followed with a bouncer past second for a two-RBI single and a 5-0 advantage that also chased Bishop Moore’s starter from the game. Bolles added to its lead in the top of the sixth. Ferguson and Inclan both walked, and a fielder’s choice on an infield grounder erased Inclan advancing to second before the relay throw sailed high to allow Ferguson to round third base and score standing up.